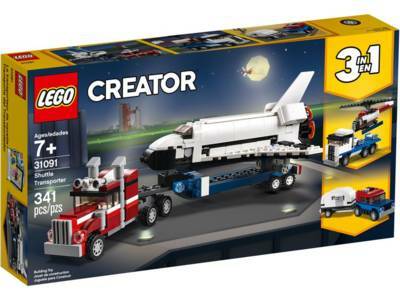 Take off on out of this world adventures with the LEGO® Creator 3in1 Shuttle Transporter set. Drive the powerful flatbed truck to the launch site, unload the awesome space shuttle and blast off into space. Then open the payload bay doors and use the onboard crane to put the satellite into orbit. When you're done, head back to earth for a perfect landing, load up the shuttle and transport it back to base ready for another exciting mission! Rebuild this 3in1 set to create a cool Helicopter Transporter or head off for a fun vacation in a Car with Caravan.